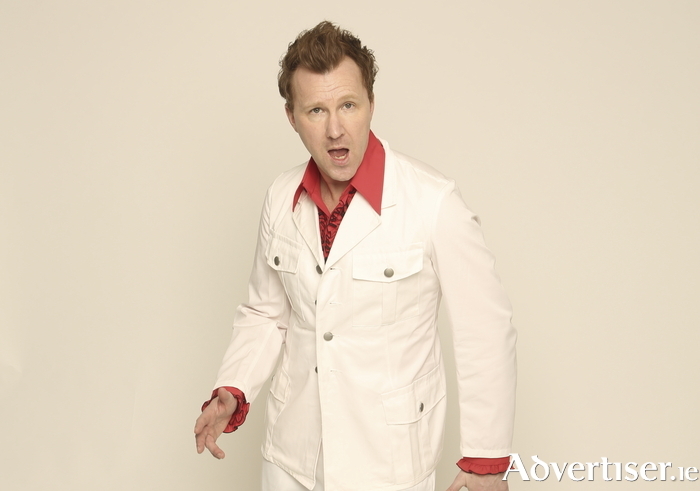 IF YOU are going to Jason Byrne’s latest stand-up show, Propped Up, there is a good chance you might see the comic - or indeed find yourself - standing on stage wearing a wolf mask - If so, Galway city is to blame. Propped Up comes to the Town Hall Theatre on Saturday February 4 at 8pm, and will involve “ducks, false chins, portable igloos, bewildered owls”, not to mention audience participation. “There’s lots of silly props - I buy loads of props, take them up on stage and then just see what I’ll do with them,” Jason tells me during our Tuesday morning conversation. “One of them is a wolf’s head I bought in TK Maxx, in Galway actually, just as I was leaving after the comedy carnival in October. The mouth opens and closes when you’re talking, it looks hilarious…I wonder if it would work in a row? If you were in a row with your wife, and it was one of those rows where she was blind with anger to the point she didn’t see you anymore, I wonder if you slipped it on your head, would she notice? Given that much of Jason’s comedy involved audience participation, the Dubliner likes how Galway audiences are among the most willing to get up on stage with him. “The Galway gigs have always been great craic and the audiences are always great, they always get up on stage,” he says. “You also have to be careful what you say as they will answer you back, and there’s always some Galway mammy in the audience, keeping an eye on what you’re talking about. I’d be looking down at the audience and see such a person, and I’d nearly say to them, ‘Is it OK if I talk about that?’"
While Propped Up will largely stay away from politics, the nature of these ‘interesting times’ means it cannot be avoided completely, and Donald Trump becoming the 45th President of the United States, is the most unavoidable of an awful brew including Brexit, the rise of the Alt-Right, and the west’s handling of Syria. For those depressed by Trump’s elevation, Jason warns that The Donald’s hair just might be his undoing - now that he will be travelling by Marine One, the presidential helicopter quite a bit. Last September saw the publication of Jason’s debut as a published author, Adventures Of A Wonky Eyed Boy, a memoir of his childhood and teenage years in 1970s and 1980s Dublin - not to mention the numerous show stealing scenes featuring his mother and father. Indeed it was the stories about his parents that initially attracted the attention of Gill publishers. “They saw me doing a show, they liked it, and said there was so much about my mum and dad that it would make a good book,” says Jason. Jason describes the book as “my proudest achievement”, and a nice ripost to an very unsympathetic school teacher more interested in disheartening students than motivating them. Wonky Eyed Boy has brought out the author in Jason and his next literary endeavour will be a children’s book, featuring fictionalised versions of himself and his family. Another project which could yet turn into something larger was Jason’s short comedy film for Sky Arts last summer, entitled The Rug, about an uptight, straight-laced couple - played by Jason and Amy Huberman (showing her talent as a comic actor ) - who steal a rug from a furniture shop, before going near insane with fear they will be caught and sent to prison (“You’ll be bummed and I’ll be licked!” ).